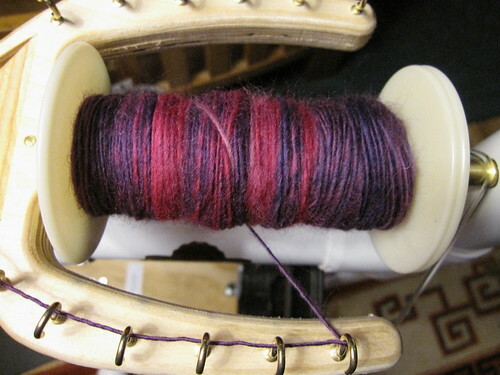 About half a bobbin full of pink and purple fiber. I’ve been making some progress on Hey Teach, too. 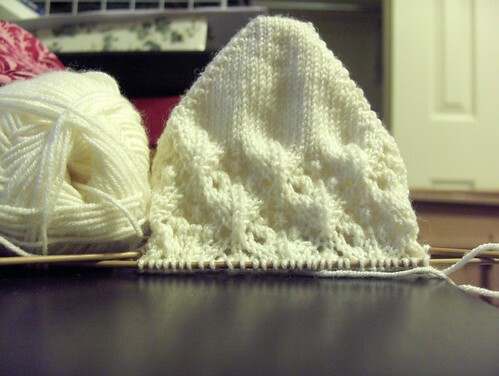 Yesterday at knit night, I finished up the left front and started on the right front. If I keep going at the pace I am, I could actually get it done this week! I’ve put aside other projects until I finish this up. I really don’t have all that much left to do, so I just need to get it done already! I still need to find buttons for this, though. I can’t decide what might look good with this yarn. I was thinking maybe wooden buttons. I’ll have to see what I can find from my favorite button shop. Recently, I’ve had a lot of questions about how I knit the toes of my socks. Many people have noticed that they are more round then most of the toes of socks they see (or knit). A long time ago, shortly after I knit my second or third pair of socks, I read on the Yarn Harlot’s blog about how she knits her toes shorter to better fit her foot by decreasing every round at a certain point instead of every other round. Most sock patterns are written that you do the increases (toe up) or decreases (top down) every other round, so every other round you’re increasing/decreasing 4 stitches. My feet are wide and my toes are kind of round (more like a slant where my big toe is the “tallest” and each goes down from there), so this method of increasing/decreasing doesn’t fit my toes the best and makes them seem rather pointy. I don’t really find this type of toe to be that comfortable, either! So, taking a bit from what the Yarn Harlot did, on my next pair, I decreased every round when I got to about 30 or so stiches on the needles. This made a rounder toe and fit better. 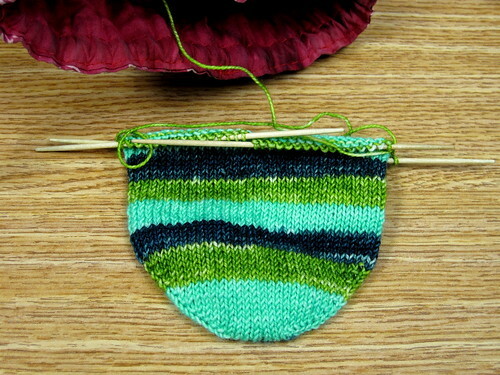 When I started doing toe-up socks, I’d been doing this “decrease every round” thing for a while, so I adapted it to toe up. Cast on 16 (4 each needle if using DPNs, 8 each needle using Magic Loop or 2 circs) using your preferred method of casting on. Increase every round for 5 to 6 rounds (depending on how round you want your toe). 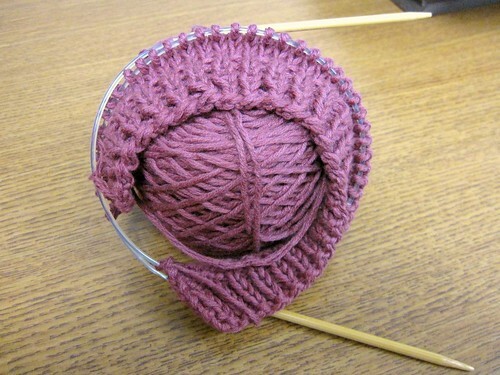 Now, do increases every other round until you are at the number of stitches needed. When I get down to 36 to 40 stitches (36 would be 5 increase rounds toe up and 40 would be 6 increase rounds), I start decreasing every round until there are 16 stitches left, then I kitchner them closed. Next Post Just keep spinning, Just keep spinning! oh my goodness linds! your spinning has improved so so much! I can SO see a difference! I agree with Laura! Wow, Lindsey! Your best bobbin yet. Not that there was anything wrong with your beautiful fall colored skeins. 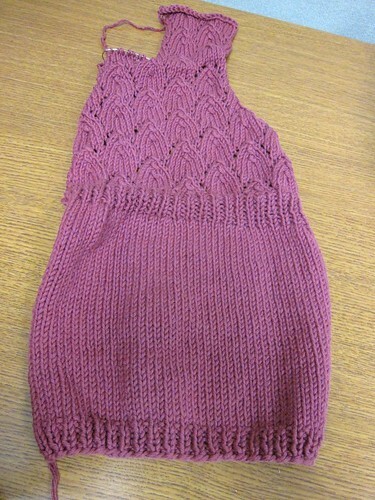 They will make a beautiful Quant or Neck Warmer. Novelty yarn and bulky weights are very hard to spin. It’s funny that when someone starts out spinning they can usually accomplish these very easily!! I love the pink/purple mix. Do you know what you’re going to use it for? Thanks for the toe lesson. Your spinning is such beautiful colors. Thank you for the tips on the sock toes. 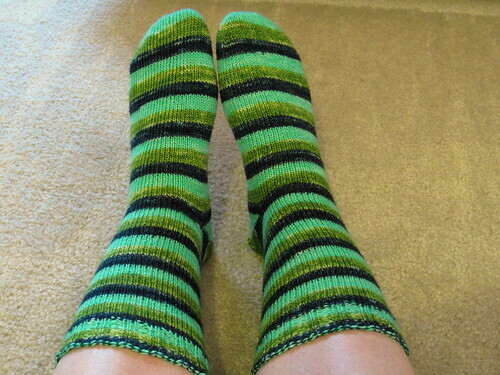 I much prefer the rounded toe, too, but I’m new to knitting socks. I’m definitely going to keep this method in mind next pair.